Are you looking for a meaningful Christmas book for your kiddos? Well, you've found it with Itsy Bitsy Christmas. This adorable book is a unique way for your children to hear the story of Christmas from the animals point of view! Two little mice hear that the King is coming and excitedly run to tell all the other animals. None of the other animals believe them, saying the Bethlehem is too small for an important King to come. Itsy and Bitsy search everywhere for the King and, in the end, finally find him in his manger. All of the animals find out the King came for them even though they were doubtful, cranky, and ordinary. 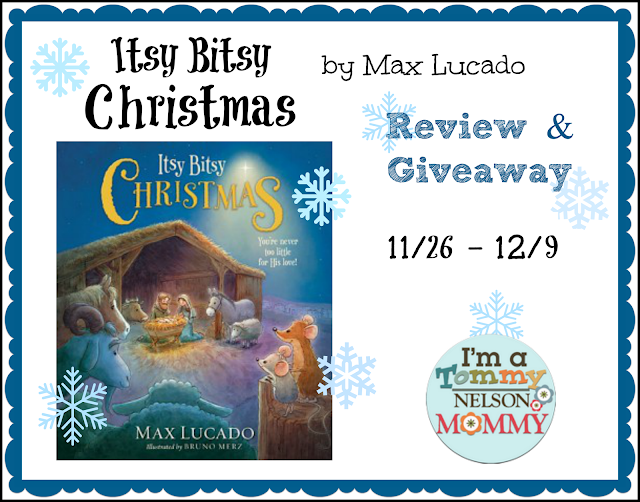 Crafted by master storyteller Max Lucado, Itsy Bitsy Christmas helps children understand God’s great love and know that He sent His Son for all of us—little or big, young or old. Thanks to Tommy Nelson you can win a copy of this book for your family. Giveaway is open to U.S. only and ends at 11:59 p.m. on 12/9. I just show my toddler love all the time! I let my youngest (2) know, there is always something he can help with. We make it age appropriate so he feels a part. He helps put groceries away in our pantry after shopping!